Yet another academic social networking site. But this one´s sponsored by the MLA, so I´ll have a go at it, and try my hand at a Narrative Theory and Narratology group and blog. There are many interest groups with the relevant tools to follow updates, news and individuals, and every group provides an option connection to an easily managed Wordpress blog which serves as an additional thematic group site. In case it doesn't show, narrative theory and narratology are among my major academic interests, so this gap had to be filled—and I've kept the administration and participation rules as open as possible. 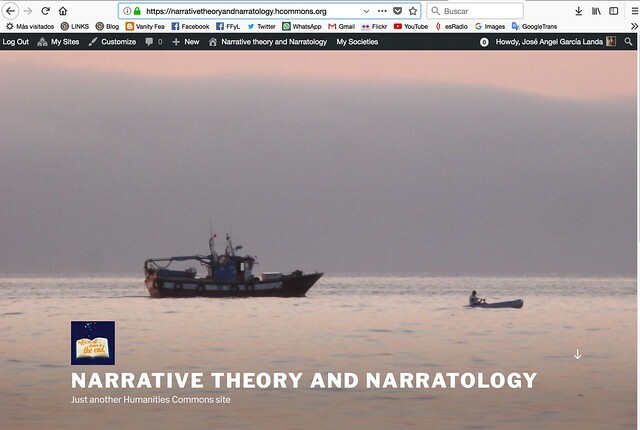 So if you are interested in narrative theory and narratology you're welcome to visit and join. I'll be publishing updates on all of these, beginning with some essential resources and interesting links at the Humanities Commons blog. One a day at most as far as I'm concerned, and let's see if this blog, or this group, or the Humanities Commons site, gather momentum eventually. Up to now this has not been the case in narratological studies; the Narrative List is still the most interactive and dynamic resource, but hey, it's high time for a blog, isn't it? It was high time ten years ago as well, and it didn't work out that way—but here we go once more into the breach.